Last month I attended a camera convention with a friend where we attended a class about cinemagraph's and how to make them. The instructor had a live model and backdrop so he could demonstrate the process from beginning to end, and it was really fun to see the process of making these moving photographs. She was adjusting her clothes as she got in position for the photo and she made a remark about women's pants as she pulled them up higher to try and get her (low cut) pants to her waist. The remark she made was something about how pants were worn higher, and then she followed that with something along the lines of "pants were worn higher up because they didn't make them for women, so they didn't fit well." and "Women didn't wear pants back then." Being a historical costumer and having recently researched women in aviation specifically, I wanted to scream. "No! None of what you just said is true!" But I sat still, cringing inside instead. It got me thinking about women and pants and just how long we've been wearing them. I've assembled a collection of women in pants dating as far back as the Civil War in the 1860's, proving that average women did in fact wear pants. 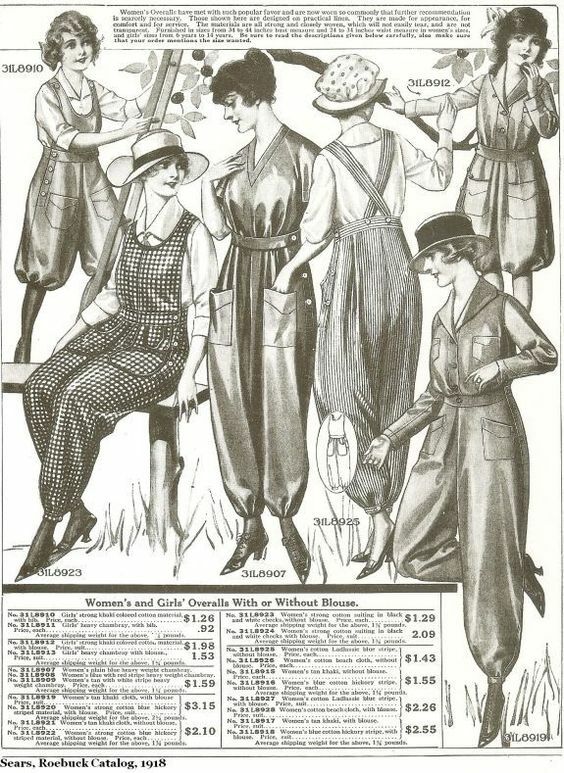 Sears Catalog c. 1918 displaying an array of pants options for women. 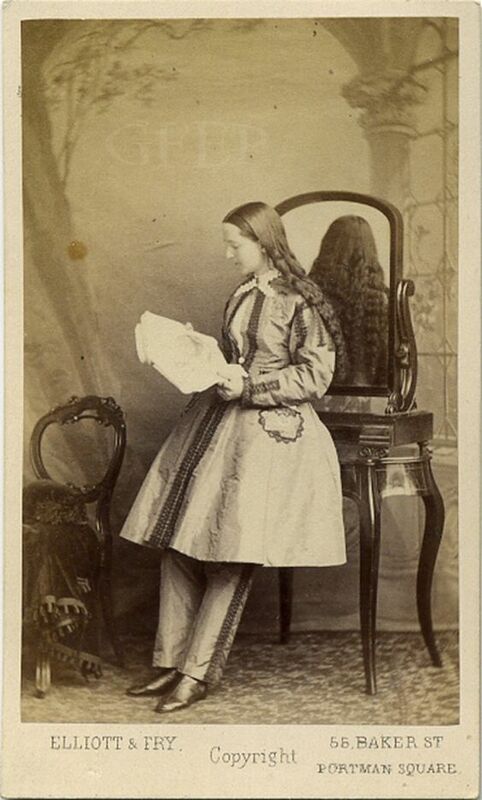 Dr. Mary Walker wearing pants in during the Civil War. As you can see, women most certainly *did* wear pants in the first half of the 20th century, and no, they weren't men's pants. I want to address a couple of misconceptions that were expressed by the model that day, and that I'm sure other's have thought too. 1. "Pants were worn higher because they didn't make pants for women." Not true. They were worn higher because that's what the fashion was at the time, for both men and women. And just like men's pants, you could find women's pants in clothing stores and catalogs. Or, you could always make a pair yourself. 2. "They didn't make pants for women." Also not true. 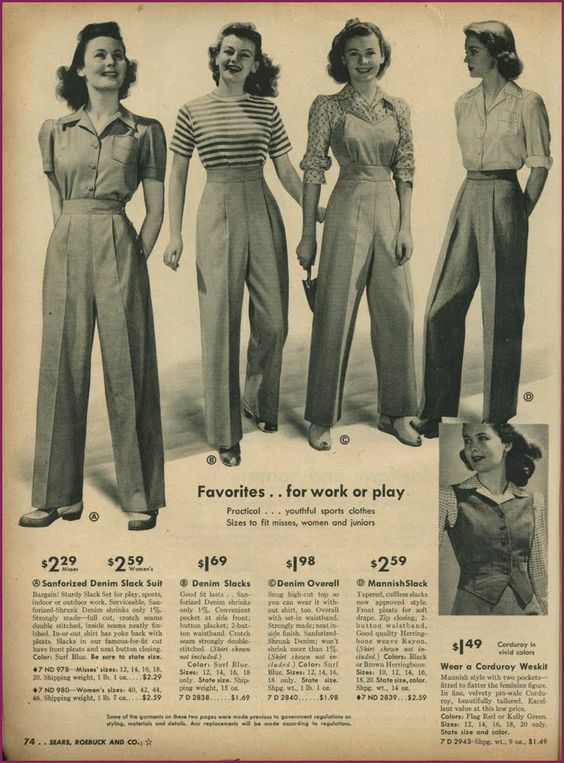 To continue off my first point, they most certainly did make pants for women, as is proved by the numerous catalogs for women's trousers throughout the 20th century (not to mention the endless photographs showing women wearing pants). 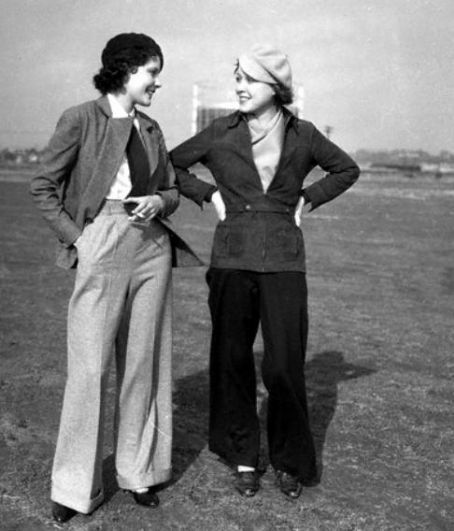 It was common for women to wear pants for sports and physical activities such as horseback riding, hiking, and flying. 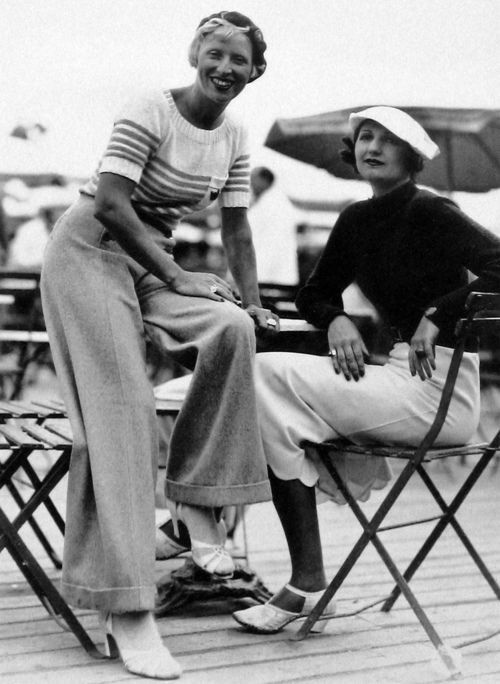 In the 30's, another style of pants called beach pajama's were common, and were a very wide leg trouser made from comfortable fabrics. 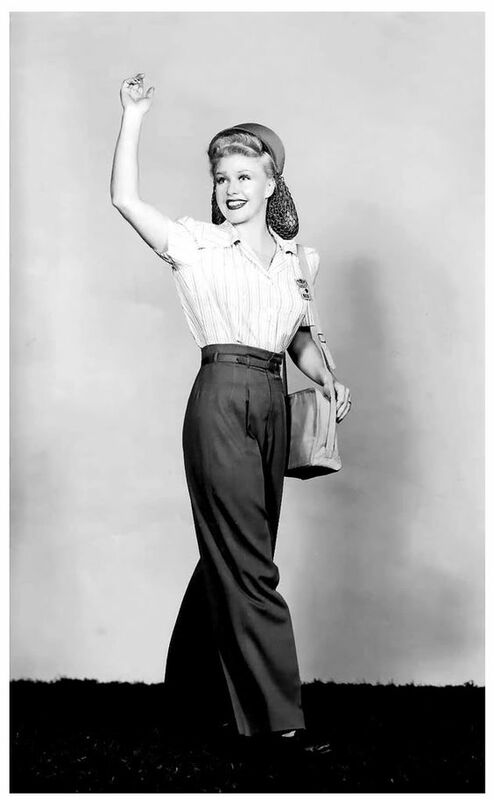 During WWII women began wearing denim trousers more as they entered the work field, as comfort and mobility were needed, though it wasn't until the 50's and 60's that it became common to wear pants on a daily basis. This is only a brief explanation of women and when they started wearing pants, there's a lot more to it, but that's all I'm going to cover for now. Hopefully this clears up some misconceptions that some people may have. Well done and very interesting! Thanks Michaela! That's a interesting. I wonder what it took for something to become a fashion plate then. 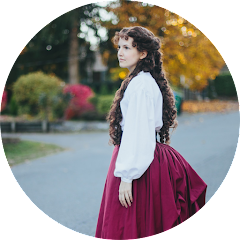 "We have not reported any Bloomer costumes since our January number, because no new ones have appeared, while, on the contrary, those worn last fall have gone entirely out of use. In fact it may be said that this fashion has proved a complete failure. We have not seen a Bloomer dress in Philadelphia for several months, nor do we expect to meet one again. In New York it is the same, and in Boston also, as far as we can learn. We predicted this termination to the proposed innovation; an predicted it, our old subscribers will remember, for two reasons. The first was that those who had tried the dress did not think it an improvement as regarded either convenience or health; and the second was that the fashion could not be made to "take", unless ladies of considerable social influence patronized it, which they did not seem disposed to do......"